to last week’s post about teaching subtraction facts and the previous post about addition. Please pull out your triangular flash cards and hold a review. 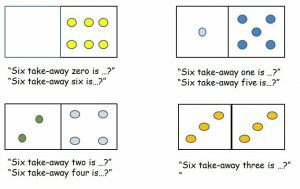 If you’ve read both posts than you know that I’ve already explained two distinct methods for teaching the addition facts and one for teaching subtraction. If it appears your child needs to relearn more than a few subtraction facts, please do not cry. It is always easier the second time around. There are many ways to go about this. My favorite is to pull out your handy-dandy “Double Twelve” Color Dot Dominoes. (Don’t have any? Maybe you should. 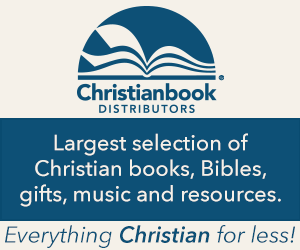 They’re very versatile and incredibly inexpensive.) As your child to separate out all the dominoes where the total number of dots is 1. You know – that domino which features zero dots on one end and a single dot on the other. Then ask her to pull out all the dominoes on which the total number of dots is two. You know, the domino with a single dot on one end and another single dot on the other, plus the domino with no dots on one end and two on the other. Then ask her to separate out all the dominoes which feature 3 total dots, 4, 5, 6… all the way to 24. Your child already knows quite a few multiplication facts. He just doesn’t know it yet! He knows all the fact families with zero, one or two. Explain that 0 x N = 0, where N is any number – only use specific examples for N. “If I give you three cookies zero times, you don’t get any cookies!” 3 x 0 = 0 too. “If I give you zero cookies three times, you still get no cookies!” Point out that 1 x N = N, but remember to use a specific example. “Now you’re scoring some cookies. When I give you 3 cookies once, you get 3 cookies.” 3 x 1 = 3 as well. “If I give you a cookie 3 times, you also score 3 cookies. This can be a really good deal, depending on the number being multiplied together with one!” Use plenty of specific examples. Have fun! This is a great time to work with your child to make triangular flash cards for all the multiplication fact families you’ve just discussed. Your child now has the dexterity and handwriting to be a real help when manufacturing triangular flash cards, and the exercise helps him begin to memorize the facts. We used triangular flash cards for our addition and subtraction, but just in case this is an new idea for you, I’ll explain. Triangular flash cards show an entire fact family on the face of the card. The card above and to the right is the “3×9=9×3=27, 27/3 = 9, 27/9 = 3 card. 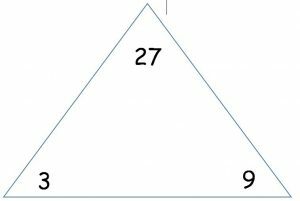 If you wanted to drill your child on multiplication you’d hold the card up with your thumb over the 27 and say, “three times nine equals…?” Traditionally the product of the multiplication goes on the top and the two factors go on the bottom two corners. Later we’ll use these exact same cards to master division, so it will pay you to do a good job manufacturing them and store them in a safe place. When you’re done manufacturing the cards together, drill him on these facts, praising him for mastering so many facts so quickly. It should go very quickly indeed. You can highlight these facts on a multiplication table, such as the one I’ve provided for the purpose of tracking your progress. 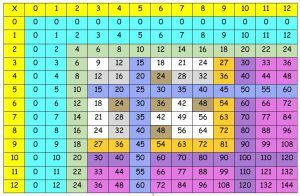 Multiplication Here is a PDF Multiplication Table you can print out. It is a good idea to highlight all the facts your child has mastered, more or less as this mastery is demonstrated. It’s good for morale! Here’s another one of my technicolor tables. Yes, I love color. You should have already highlighted the zero and one facts. Point out to your child that multiplying a number by two is the same as adding doubles. 6+6=2×6=6×2=12, for instance. This means that he already knows his “times two” facts. Have him build the triangular flash cards and drill him on those facts, just to make sure it sticks, but you should be able to color in the “times two” facts I’ve highlighted in light green. are all the “times ten” facts. Explain to your child that twenty is literally two tens, thirty is three tens, forty is four tens, etc. Alternately, explain that in order to multiply ten times seven (for instance), he need only hold up seven fingers and count up by tens to the seventh finger. He can use all ten fingers for 10×10=100, all ten fingers and one ear for 11×10 = 10×11 = 110 and all ten fingers and both ears for 12×10 = 10×12 = 120. As always, make the triangular flash cards and drill – but I’d be surprised if mastery took long at all. The “times five” facts, which I’ve highlighted in periwinkle blue, are mastered in much the same way the times ten facts are. For 8×5 = 5×8 = 40, have your child hold up 8 fingers and count up to forty by fives on his fingers. Again, ten fingers and an ear will do for 11 and ten fingers and both ears will do for 12. Make those flash cards and drill, drill, drill. Mastery will take a bit longer this time. When it’s done you get to color in all the “times five” facts. The pink facts aren’t hard either. 11 x N = 10N + N. If Algebra wasn’t your thing, then consider that eleven times three is just ten times three (30), plus three equals thirty three. Bear with me. Look at the chart below. Your child has memorized his times ten facts. He can do this. It’s new, but it’s not hard. Spend a day or so mastering these. It’s time well spent. Make the flash cards, drill a bit and highlight the “times eleven” facts. You and your child have plowed through more than half the chart and it’s been pretty easy. the rest will be easy too. 12 x N = 10N + 2N. Again, if you and Mr. Al Gebra were never pals, hang in there. Read the chart. Your child has memorized the “times two” and the “times ten” facts. Putting them together won’t be so bad. See what I mean? Notice that the charts are shrinking? You didn’t really need the “times five” facts in either chart. The facts are getting slightly easier, but there will be fewer and fewer to each set. As always, make the flash cards, drill to mastery and highlight the newly mastered facts on the chart. Notice that there’s only six “times nine” facts left to be mastered. Yes, if you count backwards and forwards separately, there are eleven, but you don’t have to MEMORIZE eleven. If you memorize the six you’ll get eleven mastered, which is a pretty good deal! This time we’re going to work a pattern to get our answers. We now know what it means to multiply by nine, so it doesn’t matter if we cheat a bit to make memorization of these facts easier. Firstly, please notice that all the “times nine” facts have digits that add up to nine. For example, 3×9 = 9×3 = 27. 2+7 = 9. As another example, 7×9 = 9×7 = 63. 6+3 = 9. There’s another pattern. The first digit of our answer is always one less than the number we’re multiplying with nine. The answer to 3×9 =9×3 has the first digit “2,” which is one less than three. The answer to 7×9 = 9×7 has the first digit “6,” which is one less than seven. If all this gives you a throbbing headache, read the chart. I honestly think it’s easier. Train your kid to perform this drill for the “times nine” facts, make the triangular flash cards and drill, drill, drill. Highlight your latest triumph and look at what’s left to be mastered. Not bad! So let’s have a look at the “other oddities.” I’ve highlighted the “times four” facts in tan. You can generally teach your child to “double” the “times two” facts. For some reason doubling numbers is easier than many other addition and multiplication tasks. Your child has memorized that 2×3=3×2 = 6. “Doubling” the answer to the “times two” fact to get 4×3=3×4 =12 is pretty easy. This works well for all most of the times four facts. The even “times six” facts aren’t so bad. Your child just has to “add up” from the “times five” fact. For instance, 6×4=4×6 is 4×5 (20) plus 4, for a total of 24. This works well for the even numbers, but often works poorly for the odd numbers. I have highlighted those even “times six” facts in brown. The “times three” facts are worth teaching some children to count by three. Then they can calculate the answer to “times three” multiplication questions by counting up as they did with the “times two” facts. Some of the “times eight” facts can be taught by “doubling” the applicable “times four” facts, but I think the bag of tricks is running thin. Near the end here, the best way forward for most children is brute memorization. Make your triangular flash cards and drill to mastery. There aren’t that many left to memorize. you should celebrate – but don’t throw away your triangular multiplication cards! You’re going to need them in order to master division facts, and your child will need to review his multiplication facts many, many more times. It takes a few years before they will stick for good! You don’t call; you don’t write; it’s like we’re strangers! Seriously, I’d love to hear from you. Drop me a line in the comment section and let me know how you’re doing. Was this article helpful? What else would you like to read about here? Do you have any ideas to share? Have your say in the fastest, easiest way possible. Click on a star below to rate this post. This is great. My son is a year old now and I think that this type of resource is very necessary for parents with kids of school going age. It will allow you as a parent to add a different element of learning to their curriculum. Please keep up this great work. I was always good with multiplication facts but not addition. I still have to count my fingers..lol, so bad! I think I will use my dominoes and do a refresher! 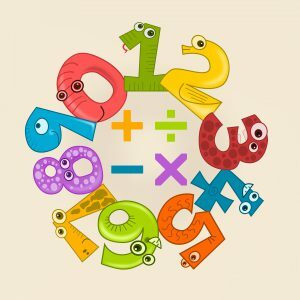 Great information to help children tackle math in a fun way! I think when kids are confident in math, the rest of schooling is a bit easier. 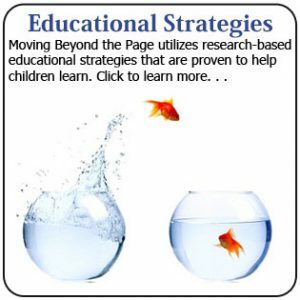 All of these are such helpful strategies… why is it I don’t remember having these tools and methodologies when I was a kid? 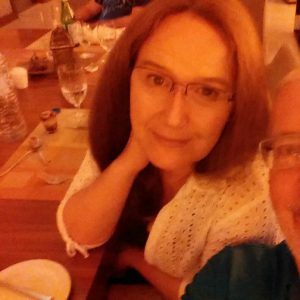 They are really great, I have several nieces and nephews that could benefit from them all, as they are all different ages. 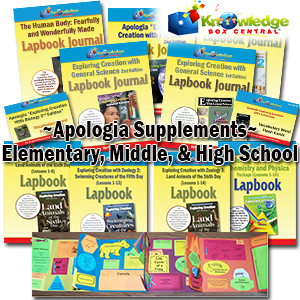 My sister homeschools them and this entire website would be a wonderful resource for her! I am going to share this with her and send her your way. Thank you, Jen. These strategies weren’t offered to me when I was in school either. If they were I would have learned to love math sooner!